Image: Gallo Images Finance Minister Nhlanhla Nene. The irony of it all is that Nhlanhla Nene was reluctant to return to the job. It took some serious convincing by President Cyril Ramaphosa for him to finally agree to his reappointment as finance minister. Nene was sitting pretty in business, his highly publicised firing as finance minister by the unpopular president Jacob Zuma having suddenly made him one of the most sought-after potential board directors in the private sector. It was Thebe Investment Corporation that first snapped him up as a resident adviser; then Allan Gray appointed him onto its board as a nonexecutive director and he also became chairperson of the Western Cape-based investment group, Arise. His stock had risen so high that, in January - following the Zuma faction's loss of the ANC presidency at the party's national conference - even the state-owned electricity utility Eskom wanted him on its board. Nene turned down the parastatal. But when Ramaphosa came knocking in February - soon after Zuma had been forced to step down by the ANC's national executive committee - Nene knew the new president would not take no for an answer. "From the onset I knew that the president had made up his mind and it would not change," Nene told colleague Qaanitah Hunter soon after his appointment was announced. "I tried to resist a little, but I knew. He had made up his mind," he said. Nene was not the only victim of Zuma's Gupta-influenced axe who was not eager to return to government once Ramaphosa took over. His erstwhile deputy in the finance portfolio, Mcebisi Jonas, was able to convince Ramaphosa that he was better off trying his hand out in business, rather than joining the cabinet. Given the developments of the past few days, Nene must be thinking to himself that perhaps he should have been as emphatic as Jonas in saying no. For now his political future hangs in the balance. And if Ramaphosa does decide to drop him from cabinet on the basis of the controversy surrounding Nene's revelation that he had several private meetings with the Guptas while serving as deputy minister as well as finance minister, there is no guarantee that the opportunities he had in business before his February appointment would still be available. 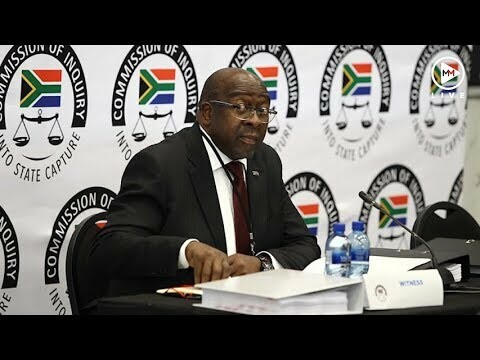 The Gupta meetings saga, especially the fact that he concealed the facts around it until recently, appears to have severely damaged Nene's reputation. But whatever Ramaphosa's decision on the minister's future, one issue we will have to consider as the public are the possible ramifications of the aftermath of Nene's appearance before the commission of inquiry into state capture. If Nene does indeed lose his job for finally owning up to having visited Saxonwold and other Gupta properties, would this not scare off other cabinet ministers, senior civil servants and politicians from appearing before the commission and telling deputy chief justice Raymond Zondo what they know and saw? Presumably, most of those who have a story to tell do because they had direct dealings with the family and other role players in the state capture operation. As a result, there may be an embarrassing skeleton or two that may tumble out the moment they open their mouths. Now who stands to benefit from potential witnesses withholding evidence out of fear that they may inadvertently talk themselves out of their posts and reputation? None other than the very same Guptas and those who assisted them in capturing the state - that's who. Indeed Nene should be held accountable for concealing crucial information, as well as misleading the public. But his punishment should not send out a message that it is better for a politician to remain silent than to own up to their indiscretion. Besides, is it not ironic that a minister can lose his job for admitting that he visited the Gupta compound while his colleagues - who have been found by the country's courts to have been dishonest - continue to sit pretty in the cabinet?